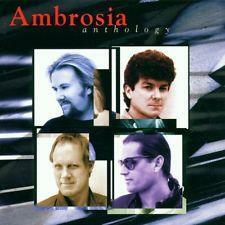 Ambrosia Anthology is a greatest hits collection by the American-Californian band Ambrosia.Released late 2015, Ambrosia Anthology has the band's greatest hits since 1970. Known for their love of The Beatles and the Beastie Boys, Ambrosia have been great inventors of music and introduced sync pop to the music industry, way back in 1970. Ambrosia's greatest hits collection includes 3 of their U.S Top 40 hits including the 1978 single "How Much I Feel" from their third album Life Beyond L.A..
However,their best year in music was 1980 when they had two top 40 hit songs including "Biggest Part Of Me single" and "You're The Only Woman" from their most popular album 1/80.David Pack wrote the lyrics for all their Top 40 Hits. "You're The Only Woman" would be Ambrosia's last Top 40 hit in the U.S, the band floundered after this single and was abandoned in 1982 only to reunite 7 years later in 1989. Even though some original members of the band left,the band is still intact but are finding it real hard to bridge the generation gap by working through the minds of millennials through their music, to make some big money.